In 2004, Metro Nashville released a study recommending the construction of additional convention space in Nashville, either through expansion of the existing Nashville Convention Center or development of a new downtown convention center. The Music City Center Committee was formed to study both possibilities, and in February 2006, presented a report demonstrating the best option would be to build a new convention center - one large enough to accommodate 75 percent of the nation's convention and visitor market. The project gained momentum after Karl Dean was elected Mayor in September 2007. Dean announced early on that one of his priorities was seeing the construction of a new downtown convention center come to fruition. The Music City Center Coalition was formed by business leaders, grassroots community activists, and many Nashville residents to support the project. In January 2010, the Metropolitan Council of Nashville voted to approve construction of the Music City Center and the official groundbreaking for the center was held on March 22, 2010. It was decided that the convention center would be built in the new SoBro neighborhood, south of Broadway and right in the heart of downtown. The area was known as Black Bottom until the 1950s, nicknamed because of periodic river floods that left muddy residue on the streets. The new building was designed by Atlanta-based TVS Design, Nashville-based Tuck Hinton Architects, and Moody-Nolan Architects and a joint venture, Bell/Clark, headed up the construction management. Before work could start going up, the site teams had to start by going down. Over 200,000 cubic yards of rock and soil were excavated and the 16-acre site took 24 weeks to excavate. Soon after, the six red cranes were erected, the tallest of which reached 200 feet. 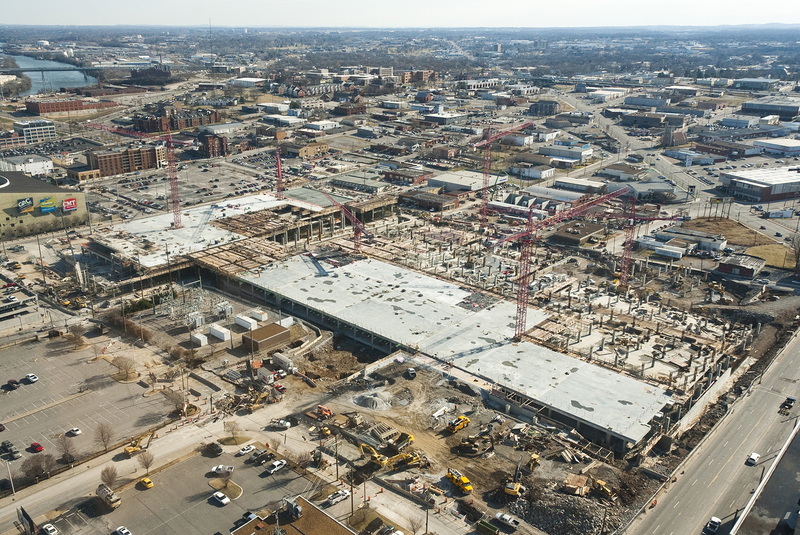 The concrete team placed 110,000 cubic yards of structural concrete and 13,500 tons of rebar. Over 100,000 man hours were spent deciding where each piece of steel would go and 14,000 tons of structural steel was eventually placed. The project took three years to complete and over 7,300 people worked on the project during that time. In May 2013, the building was opened to the public during a two day Grand Opening celebration. Over 15,000 people toured the building and activities included live music, great food, and a zip line through the Exhibit Hall. Since then, the building has been filled, with great events such as CMA Fest's Fan Fair X and the Music City Sports Festival.